I Go Cuckoo For Coconut Rice! COCONUT RICE! One of the joys of cooking is always learning! I was excited to meet my fellow foodie at Tealicious Cafe in Bangkok, Thailand. It was a long plane ride. I did sleep. But, I felt like I was in twilight zone. The cab ride was wonderful. Great to get back on terra firma. Lisa recommended the Pineapple Fried Rice . It was the first time I enjoyed this wonderful meal. Y-u-m-m! Whenever I prepare this dish at home, it reminds me of good times in Bangkok. Lisa said, “A big part of the great flavour is the coconut rice.” Today, some foodies have embraced this rice as their all time standard fare. 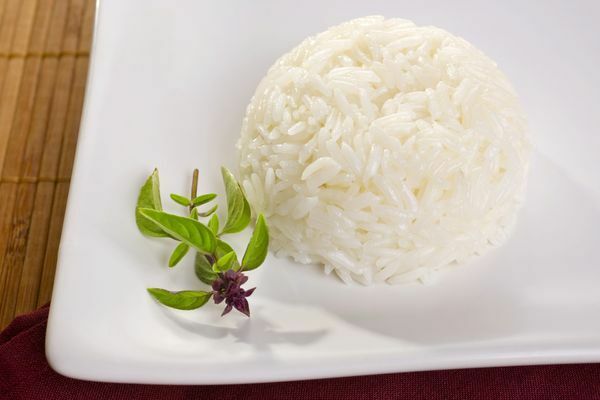 Your guests will comment favorably on your dishes when you use this not so secret “coconut” rice. It is as easy to make as regular rice! Empty can of coconut milk into a pot. Fill the can with rice and pour into the pot. Fill the can with water, swirling to get all of the rice out, then pour it into the pot. Reduce heat to medium, cover and cook for 20 minutes without removing the lid. Turn off the heat and serve the rice when you have finished preparing your meal. This can sit in the pot undisturbed for up to 10 minutes. Fluff and serve. You only have one pot to wash! There are many other instructions that can be given for making rice but this recipe is for the busy person to make it fast and it works! You can put the timer on for 20 minutes and let it cook while you prepare the rest of the meal. Then it’s all done at once! You can optionally add the cardamom for a delicate flavour. You can optionally add the lemon as the acid to balance out the sweetness of the coconut milk and also it will help your body to become more basic for better health. You do not taste it as a specific lemony flavour. It just adds to the overall result. Now, we are going to FLAVOR~TOWN! As shown in the final photo, you can easily freeze any leftover portions in glass for a future side dish or stir fry. FOOD TIP: Coconut milk can be found in cans or in the powdered form. Any leftover liquid milk can be frozen in ice-cube trays, then transferred to freezer bags to add to curries or soups. You can rinse the rice until water is clear before cooking. Rinsing gets rid of starch that makes rice sticky. Michelin three star Chef Ramsey uses cardamon pods and star anise (anise benefits include killing off bacteria and fungus & naturally fighting off the flu ) for making rice. Three split cardamon pods may be enough flavour for you. Try it and see how you like it. Grilled shrimp on coconut rice!M-M-M-M-M-M-M GOOD! DID YOU KNOW? Coconut water is filled with antioxidants and electrolytes. Not only is coconut water low-calorie, but it is super hydrating. DOCTOR’S CORNER: A new addition to my foodie posts is “Doctor’s Corner”. If the recipe has an ingredient that has a health benefit, this is the place you will find me writing about it. For instance, coconut is good for brain health. Coconut contains MCT or medium chain triglycerides, as opposed to long chain triglycerides (LCT), which are found in other fatty foods. Medium chains are easier to digest. MCT helps balance gut bacteria, and is protective against pathogenic bacteria and viruses – this means a healthier microflora. Did you know 90% of serotonin is produced in the gut? Serotonin is good for brain health. Coconut oil has the most MCT of all the oils at 55%. Coconut milk has 14% MCT. Interestingly, butter has 8% MCT. A trace amount of “medium” length fatty acids are stored in our fat cells after ingestion. Energy (from ketones) is released quickly using MCT based foods. At the same time, the production of free radicals is reduced. This is important for brain health, as free radicals are unstable and destructive, and increase the risk of developing neurodegenerative diseases. Higher levels of ketones are beneficial for prevention and treatment of neurodegenerative diseases, such as Parkinson’s, epilepsy, and Alzheimer’s. There is also emerging research supporting ketones playing a role in improving mental health disorders, such as ADHD, PTSD, bipolar disorder, and schizophrenia.